My UMass Boston is here! Download for iOS or download for Android. Stay connected with your fellow UMass Boston Alumni with the new Alumni app on your iPhone or Android device. Whether you're looking for a new job, a long-lost friend, or just trying to catch back up on all the impressive things members of our community are up to, this is your go-to app! ClassRing: UMass Boston have connections to hundreds of schools and thousands of companies. 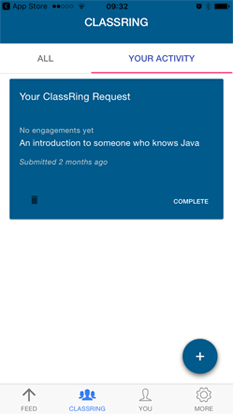 ClassRing makes it easier than ever to ask the UMass Boston community for introductions. Simply make a request and the app will automatically figure out who can help you and tell them how they can do so! Want to help other graduates? 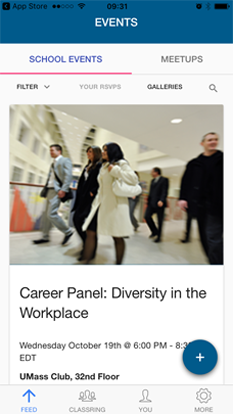 With a few simple taps, you can connect your friend who is looking to fill an opening with a fellow alum who has the skill set to excel in that role. Events: Find UMass Boston events nearby, RSVP to see who's going, and check-in to see who else is already there. 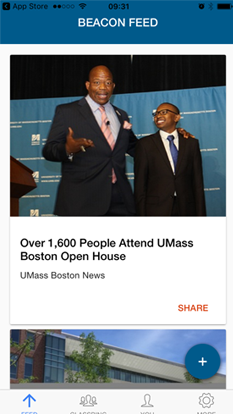 News: The UMass Boston community is full of busy people and the news feed in the app collects all that news just for you based upon YOUR interests. Just connect and enjoy! Directory: Ever wondered which UMass Boston alumni are nearby? Or who works for a certain company? This powerful networking tool helps you to connect with your fellow alums.